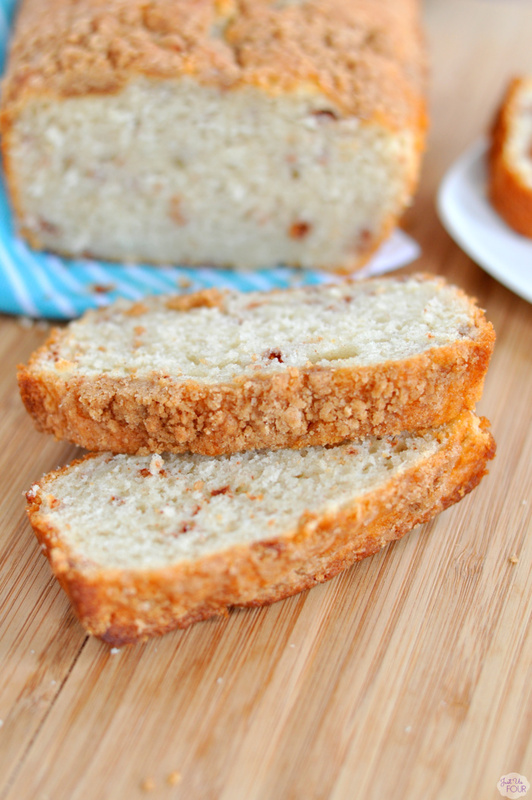 Cinnamon Quick Bread is the perfect recipe to make and keep on hand all the time. Whether with a cup of coffee or alone, it is amazingly delicious! You know that thing that happens when you aren’t supposed to eat something and it becomes the only thing you want to eat. I am right there with bread. 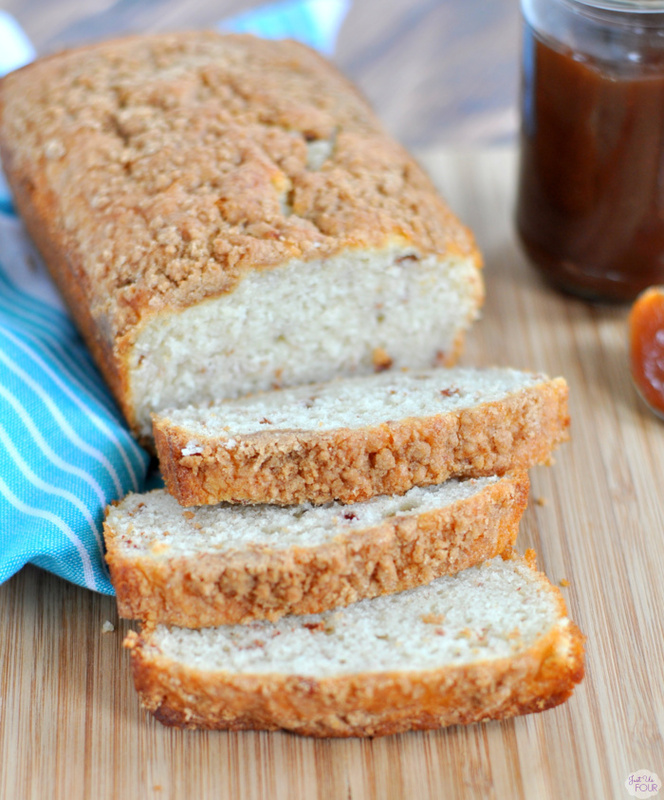 Before Christmas, I made a batch of this Cinnamon Quick Bread and it has been on my mind every day this week! Seriously, it is that amazing. The great thing about quick breads is that they don’t use yeast so there is not time waiting around for it to rise before you bake. Hence the quick part! I love this quick bread recipe just as it is but you could totally make a quick glaze to drizzle over top. It would taste so much like a cinnamon roll that it might be dangerous. Either way, it is the perfect accompaniment to your cup of coffee in the morning or as a snack in the afternoon. What sorts of foods are you craving right now? 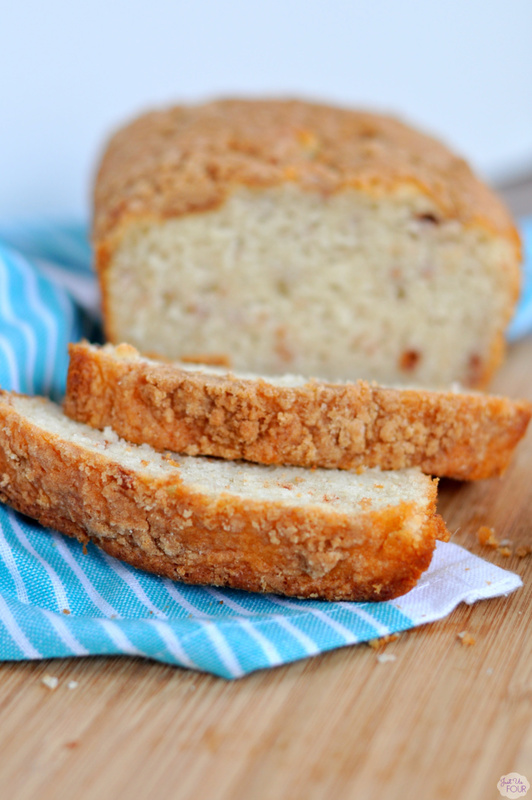 Do you love making quick breads? Preheat oven to 350 degrees. Lightly spray a loaf pan with baking spray. Set aside. Combine flour, baking soda, baking powder and 1/2 tsp salt in a large bowl. Stir well to combine. Beat together 5 Tbsp butter and granulated sugar until smooth. Add eggs, one at a time. With the mixer on low, alternate additions of flour mixture and buttermilk; ending with flour mixture. Mix until just combined. Transfer batter to prepared loaf pan. In a small bowl, combine brown sugar, 1 Tbsp flour, 1/4 tsp cinnamon and melted butter. Sprinkle on top of batter in pan. Bake at 350 degrees for 45-50 minutes or until a toothpick inserted in the center comes out clean. Cool in pan for 10 minutes and then remove from pan to cool completely on a wire rack. This would be a great treat for breakfast! Yummy! I can see why you’re still thinking about it – this bread sounds so amazing! I bet I’d be sneaking slices all day long 😉 Pinning! I love quick breads, this looks amazing! Thanks for linking up with What’s Cookin’ Wednesday! Thanks for sharing this bread recipe at Craft Frenzy Friday! It looks delicious!